Cooler Master’s HAF 912 further enriches the HAF series by adding a compact, yet fully featured, mid-tower solution for enthusiasts and budget conscious gamers alike. 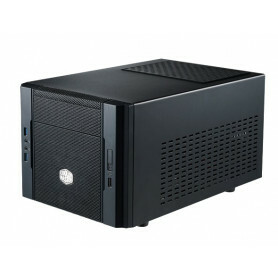 Its seemingly small exterior supports a plethora of interior features such as twelve devices, high end GPU cards like the ATI Radeon HD 5970 and the NVIDIA GTX 480, large CPU coolers, two 200mm fans, and six 120mm fans. The HAF 912 embodies the rugged aesthetic and qualities of its brethren while remaining attractively priced. Its traits more closely resemble that of a mid to high-end case than that of other cases in its price range. The HAF 912 pays tribute to the legacy of HAF 932 & HAF 922 in ease of installation, high airflow, and compatibility with water cooling hardware. Large rubber grommets support tubes routed from an externally mounted 2 x 120mm radiator. Internal 240mm radiators are supported, but clearance may vary depending on hardware used. 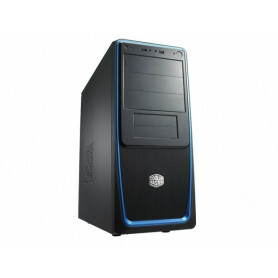 The HAF 912 is 9.1" wide, an inch wider than comparable mid towers in its class. This allows for an extra .61" inches behind the motherboard tray with convenient cable management cutouts. 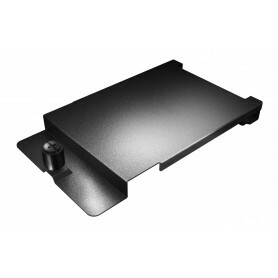 The HAF 912 is engineered to fit large cables behind the motherboard using the cable tie attachment points on the rear of the motherboard as well as a CPU retaining hole. An evolved version of our CM 690 II modular hard drive bay design is present in the HAF 912. This new design allows the hard drive cage to be removed and rotated to the left 90 degrees. The upper portion of the hard drive cage is removable and 90 degree rotatable. Hard drives can be oriented facing front to back, or side to side depending on hardware compatibility and user preference. Several options become available when the hard drive cage is detached. The 2.5” hard drive cage can be relocated to the top of the fixed 3.5” hard drive cage on the bottom to make room for power supplies over 8.5”. After removing the upper hard drive bays, the newly freed up space allows long graphics cards such as the ATI HD5970 and NVIDIA GTX 480 to fit without problems. Rugged militaristic inspiration drives our HAF series. 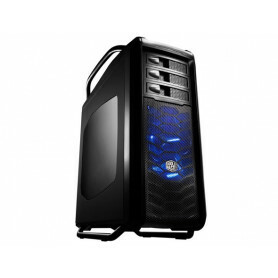 Our HAF 912 continues to speak to the aggressive and competitive nature inherent in most gamers. Meshed paneling on the top, front, and bottom assist the fans in removing excess heat from your precious components. Dust filters have been strategically placed on fan inlet spaces on the front and bottom of the case to prevent dust from entering the system. They are easily removable to allow for speedy maintenance. * Supports two 120mm radiator fans. * Front I/O for easy access. * Top platform for personal belongings. * 7+1 slots for increased expandability. * Two 3.5" or 2.5" / 1.8" HDD/SSDs. 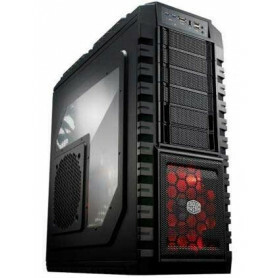 * Supports high-end graphics cards like ATI HD 5970 and nVidia GeForce GTX. * Removable dust filters on the bottom and front cover.